SR 130 – Shree Amee Construction Equipments Pvt. Ltd. Radial lift (SR) modelengineered for digging, prying and pushing. Operating environmentdelivers more room, visibility, comfort and control. Sealed cabsignificantly reduces the amount of noise and dust. 25 percent larger cabsare the widest in the industry. Revolutionary ultra-narrow wire side-screendesign with more glass surface area provides 360-degree visibility. Case exclusive side lightinglets you get more done – day or night. Switchable controlsallow you to choose from standard mechanical drives or optional electro-hydraulic (EH). New Power Stance chassis letsyou lift and haul more material with up to 21 percent longer wheelbase and 30/70 front/rear weight distribution. Ride Controlprovides superior stability and operating speeds, regardless of jobsite conditions. 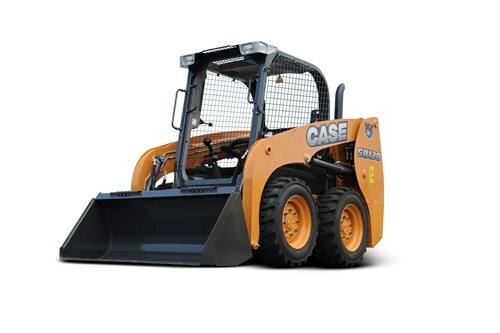 Improved fuel efficiencycombined with new 16- to 25.5-gallon fuel tanks help Case skid steers run all day without refueling.